The vertebrate inner ear is in charge of transforming mechanical stimuli from sound and head movement into electrical signals that are sent to the brain. This so-called “mechanotransduction process” requires exquisite precision and sensitivity, as well as robustness to withstand strong mechanical stimuli. At the core of inner-ear mechanotransduction are hair cells and hair-cell tip links, the fine protein filaments that pull open mechanosensitive ion channels, thereby depolarizing hair cells and initiating perception. In a paper just published in Nature, a team from Rachelle Gaudet’s lab in MCB and David P. Corey’s lab (HHMI/Harvard Medical School) has determined new crystal structures of key components of the hair-cell tip link. The structures, along with complementary biochemical experiments and molecular dynamics simulations, sheds light on the molecular mechanics of hair-cell transduction and new interaction mechanisms for cadherins, a large protein family implicated in tissue and organ morphogenesis, as well as neuronal connectivity. The biophysics of inner-ear mechanotransduction has been fairly well understood for decades, yet some of the molecular components of the transduction apparatus have been identified only recently. We now know that the tip link is formed by protocadherin-15 and cadherin-23, two proteins that are thought to interact tip-to-tip and that are involved in human deafness and blindness. These proteins belong to the cadherin superfamily of proteins, many of which mediate calcium-dependent cell-cell adhesion and interact in a homophilic way (a member of the family interacts with itself but not with others). These findings left open several questions: How could two cadherins interact in a heterophilic way? How do these proteins convey force and what are their elastic properties? What are the molecular mechanisms causing tip-link dysfunction when these proteins carry deafness related mutations? The Gaudet and Corey labs decided to answer these questions using a combination of experimental and computational tools. In earlier work, published in Neuron, the team determined the crystal structure and elastic properties of the tip of cadherin-23, which was found to be mechanically stiff and structurally different from classical cadherins. The cadherin-23 structure, with a long N-terminus and a new calcium-binding site at its very tip, suggested that the bond with protocadherin-15 would be completely different to the homophilic bonds formed by classical cadherins. Yet the mystery about the heterophilic bond between these two proteins remained unsolved. Now the new crystal structure of the complex between the tips of cadherin-23 and protocadherin-15 reveals a surprising molecular “handshake” unlike those previously determined for any other cadherin complex (see Figure). The interaction between cadherin-23 and protocadherin-15 is more extensive than anticipated, necessitating the participation of two cadherin repeats from each protein, whereas previously observed cadherin complexes require just one. Extensive biochemical experiments confirmed the handshake bond in solution, and also revealed the molecular mechanisms underlying tip link malfunction in deafness: some mutations directly impair the interaction between protocadherin-15 and cadherin-23. 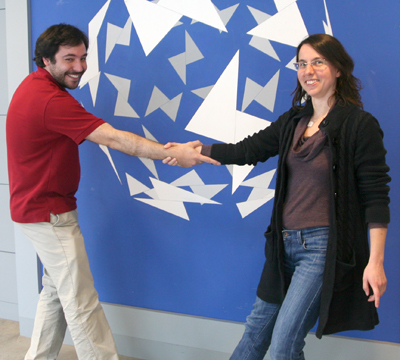 The team also used advanced molecular dynamics simulations to predict the handshake’s mechanical strength. Tip links convey forces to transduction channels, but may break apart when subjected to large stimuli, such as those generated by loud sound in a rock concert. The molecular motion trajectories from the simulations revealed that the bond is mechanically strong – somewhat stronger than classical cadherin bonds. In addition, the simulations provided models of how the bond would break under force (see video), giving insights into noise-induced hearing loss and revealed possible mechanisms underlying the calcium-dependency of the tip-link bond. In summary, the new structures and simulations provide a first dynamic view of a key bond that enables hair-cell mechanotransduction, and also open the door to explore how other members of the cadherin superfamily may interact with each other.